A Plant is Just a Plant……But What is That????. Consider: -What is a non-scientific description of a plant? -How often do you discuss a plant in your everyday. 1 A Plant is Just a Plant……But What is That???? 2 Consider: -What is a non-scientific description of a plant? 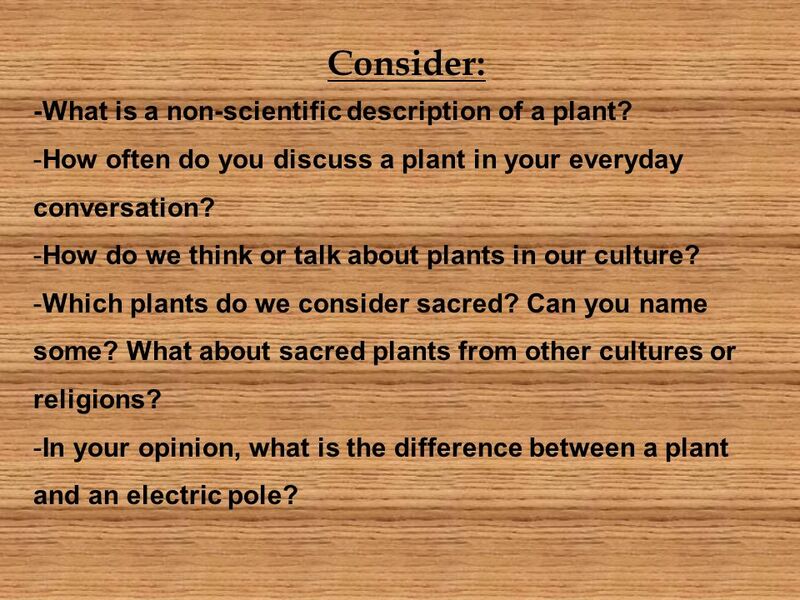 -How often do you discuss a plant in your everyday conversation? 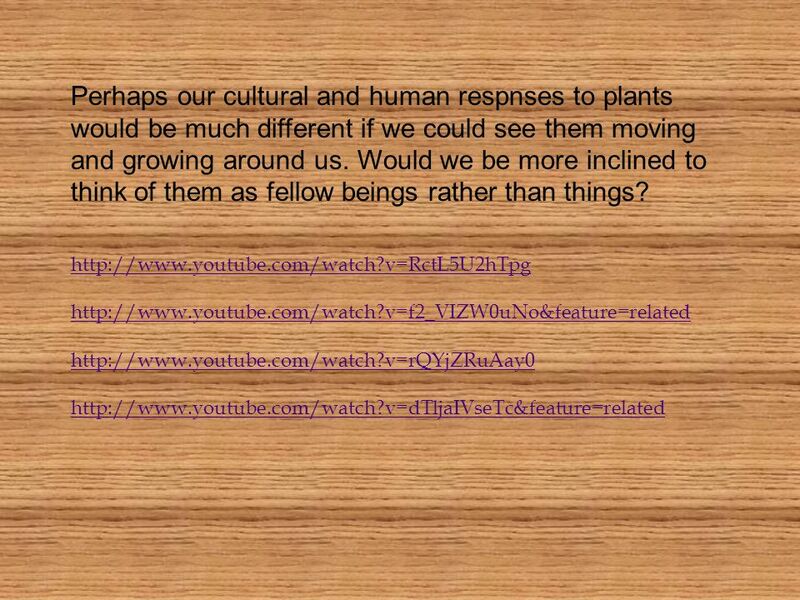 -How do we think or talk about plants in our culture? -Which plants do we consider sacred? Can you name some? What about sacred plants from other cultures or religions? -In your opinion, what is the difference between a plant and an electric pole? 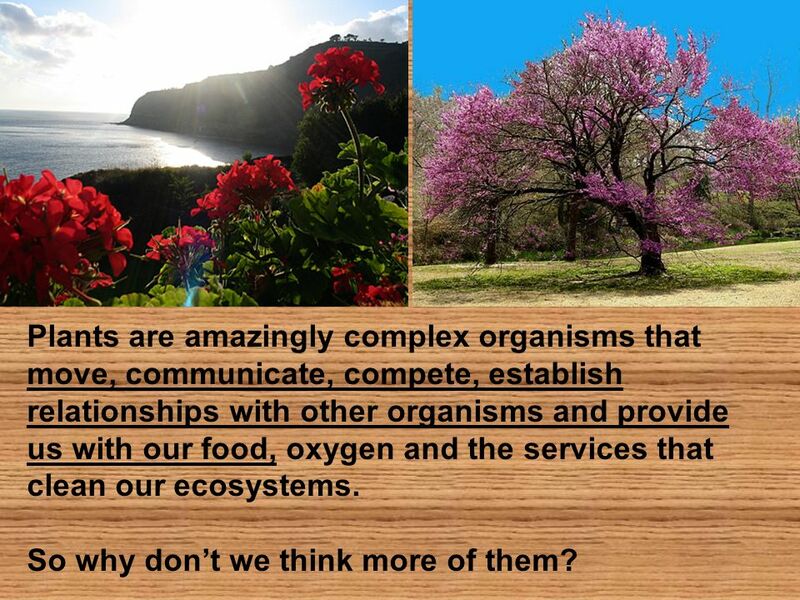 3 Plants are amazingly complex organisms that move, communicate, compete, establish relationships with other organisms and provide us with our food, oxygen and the services that clean our ecosystems. So why dont we think more of them? 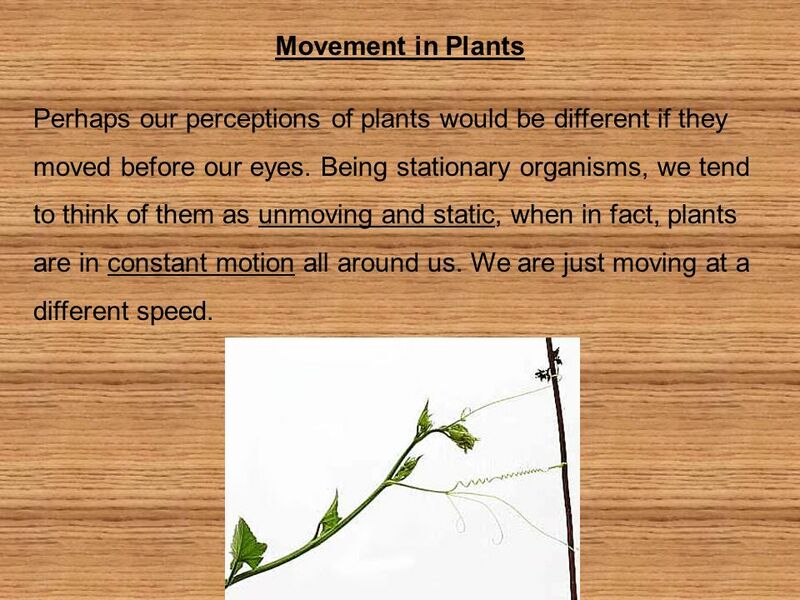 4 Movement in Plants Perhaps our perceptions of plants would be different if they moved before our eyes. Being stationary organisms, we tend to think of them as unmoving and static, when in fact, plants are in constant motion all around us. We are just moving at a different speed. 5 Plants will bend and move toward the sun with movements called phototropism. Some plants are able to move their stems toward the light within a few hours. If we could speed up time we would see all the trees and plants around us bending and moving with the suns as the day goes on. 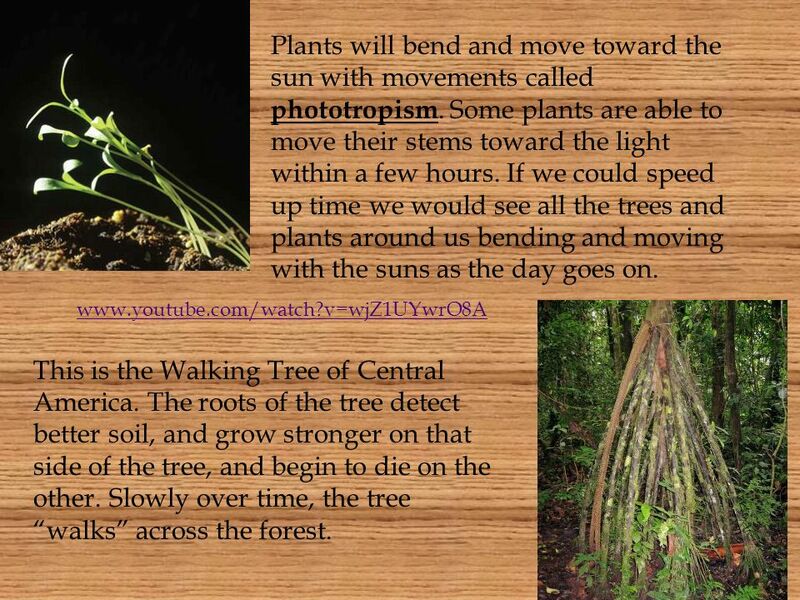 www.youtube.com/watch?v=wjZ1UYwrO8A This is the Walking Tree of Central America. The roots of the tree detect better soil, and grow stronger on that side of the tree, and begin to die on the other. Slowly over time, the tree walks across the forest. 7 http://www.youtube.com/watch?v=RctL5U2hTpg http://www.youtube.com/watch?v=f2_VIZW0uNo&feature=related http://www.youtube.com/watch?v=rQYjZRuAay0 http://www.youtube.com/watch?v=dTljaIVseTc&feature=related Perhaps our cultural and human respnses to plants would be much different if we could see them moving and growing around us. Would we be more inclined to think of them as fellow beings rather than things? 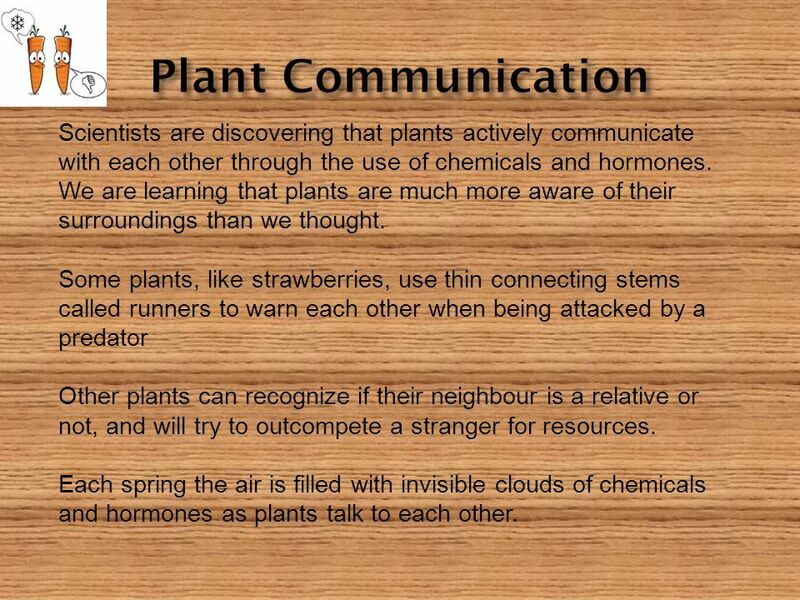 8 Scientists are discovering that plants actively communicate with each other through the use of chemicals and hormones. 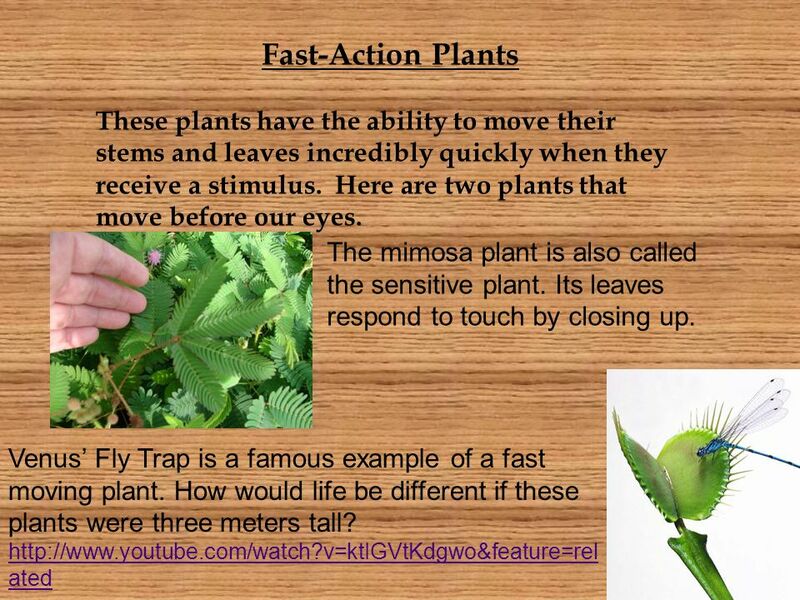 We are learning that plants are much more aware of their surroundings than we thought. Some plants, like strawberries, use thin connecting stems called runners to warn each other when being attacked by a predator Other plants can recognize if their neighbour is a relative or not, and will try to outcompete a stranger for resources. Each spring the air is filled with invisible clouds of chemicals and hormones as plants talk to each other. 9 Plants are in constant competition with each other for resources, especially sunlight. 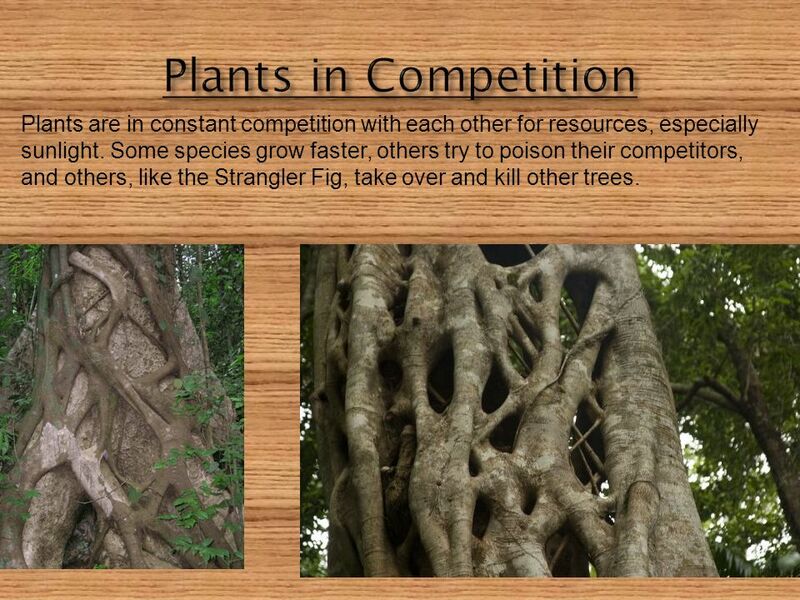 Some species grow faster, others try to poison their competitors, and others, like the Strangler Fig, take over and kill other trees. 11 Of course we know that much of our food and medicine comes from plants, but did you know that a lot of what grows outside our homes can be eaten as well? 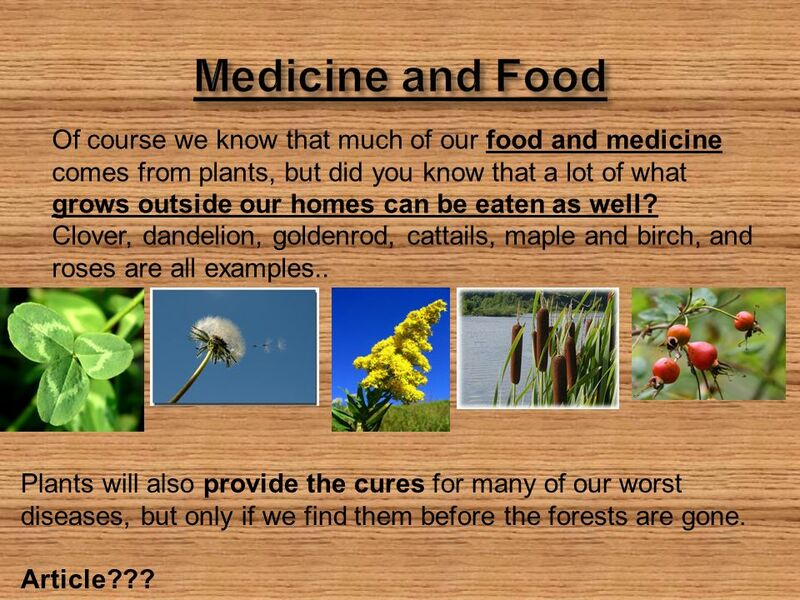 Clover, dandelion, goldenrod, cattails, maple and birch, and roses are all examples.. Plants will also provide the cures for many of our worst diseases, but only if we find them before the forests are gone. Article??? 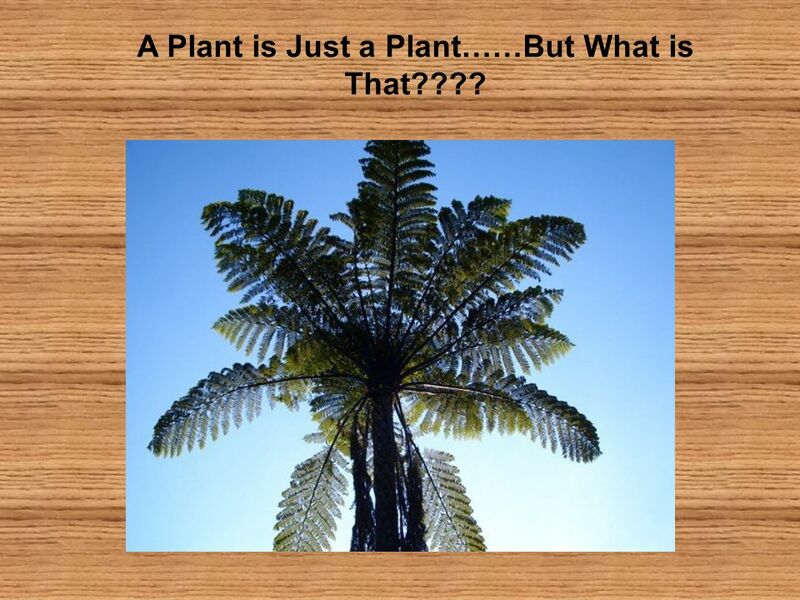 Download ppt "A Plant is Just a Plant……But What is That????. Consider: -What is a non-scientific description of a plant? -How often do you discuss a plant in your everyday." Plants are Produces Jinny, Terry, and Cindys X-File of 2.2. This song belongs certainly in this topic. Pollution of the air More poisonous gases in the atmosphere The worst situation in the biggest cities Caused. Tropical Rainforest By: Emma Bixenstine. How do water, sunlight, wind, soil, rocks, and temperature affect organisms? Water – 1. Organisms can die from lack of water – desiccation 2. Organisms. Mr. Altorfer Science Types of Interactions (Relationships) Section 18.3 Pages 490 to 497. Ecology Chapter 18. 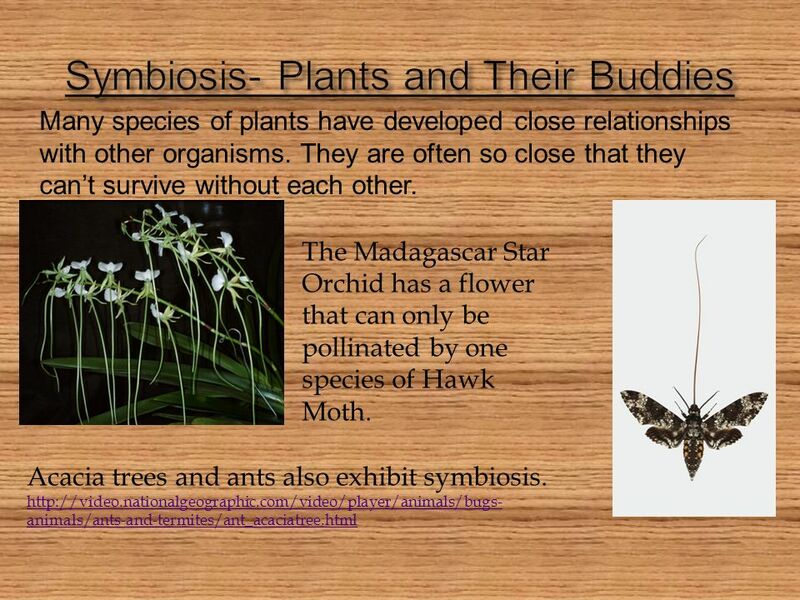 Ecology The study of the interactions of organisms with one another and within their environment. Prairies Wild! by Karen Gempel What does the word “prairie” mean to you? Do you think of a big empty field? Plants J.G.. These are 5 reasons why plants are important. 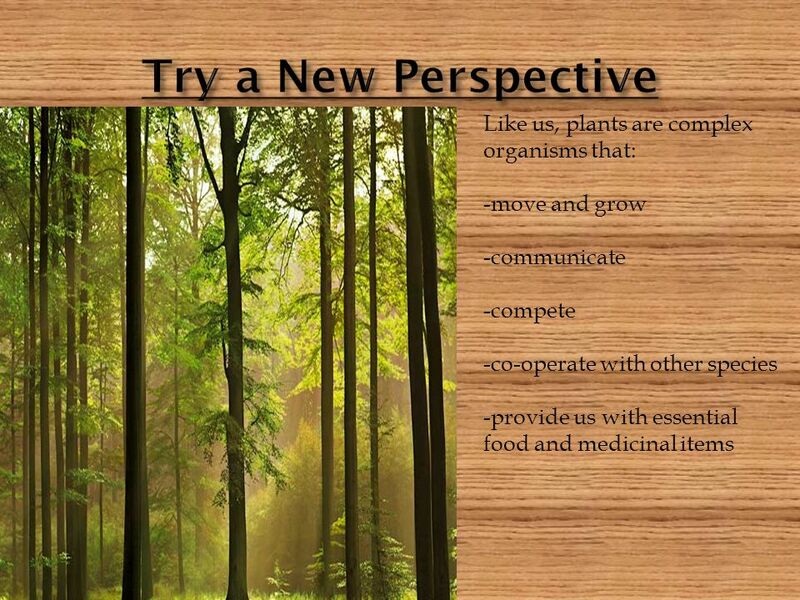 1.All of the oxygen available for living organisms comes from plants. 2.It is the oxygen that. Start Planting! Before we start…… home button Next button. How do Plant Features Help Plants? PLANTS ARE PRODUCERS PLANTS CAPTURE ENERGY FROM THE SUN. –The sun’s heat & light provide the energy almost all organisms need to live. –Light energy must.